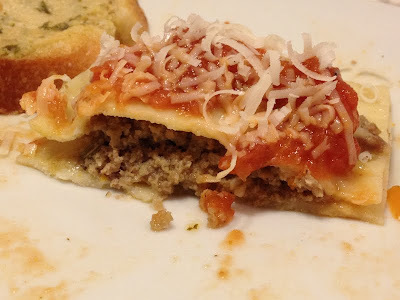 Knowing what I know now, I probably wouldn't have tried making this Sausage Filled Ravioli, adapted from My Italian Grandmother's handmade ravioli recipe. 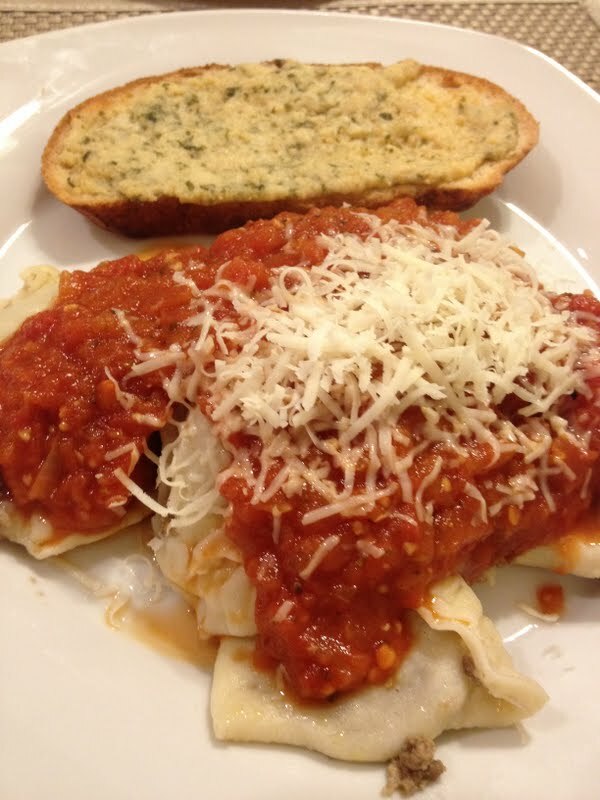 We started making Ravioli at around noon on a Saturday so we wouldn't have to rush to make it around dinner time. Little did I know it would take until dinner time to make it, but.. the end product was definitely worth it. Cook onion, garlic, carrots and onion in oil until they are soft. Just a few minutes. 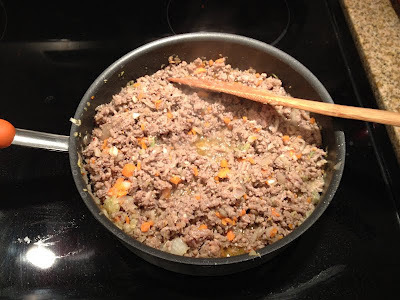 Then add your ground sausage and stir continuously with a wooden spoon, constantly breaking up the meat into very small bits. Once meat is browned, drain excess fat from pan. Then, put mixture into your food processor and blend. Be careful not to over blend unless you like your ravioli filling to be the consistency of cat food. 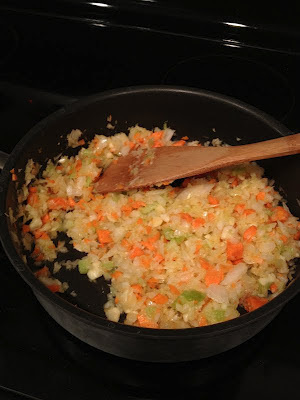 Saute onion and garlic in olive oil until soft. Add crushed tomatoes and spices. 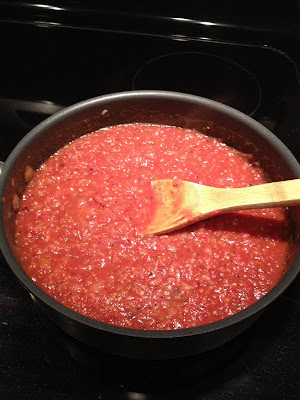 Heat sauce until it bubbles, then turn heat down to low, letting sauce simmer, stirring occasionally. Be forewarned- this part is a workout. Your arms will hurt tomorrow. And possibly the day after. Place your eggs and a dash of salt in your stand up mixer. Stir in flour a little bit at a time with the dough hook attachment. (Do not use all of your flour, save some for kneading it by hand later.) After it is completely mixed, knead dough in mixer for 5 minutes until it is smooth and easy to handle. Then let your dough rest for a half hour at room temperature. Take out small bits of dough at a time, place on a floured cutting board and start kneading! Knead for 2 or 3 minutes with a bit extra flour if needed. If you have a pasta machine, whip it out now. If not, start rolling! Flour your rolling pin and roll your dough until it is flat, about 1/8 of an inch thick.The thinner the better, but not too thin or your meat filling will burst out the sides when they are cooking. The easiest way I found to make the raviolis was to cut rectangles that are about 3" by 6". Place a scoop (use a tablespoon) of your meat filling on one side of the rectangle and fold the other side over. 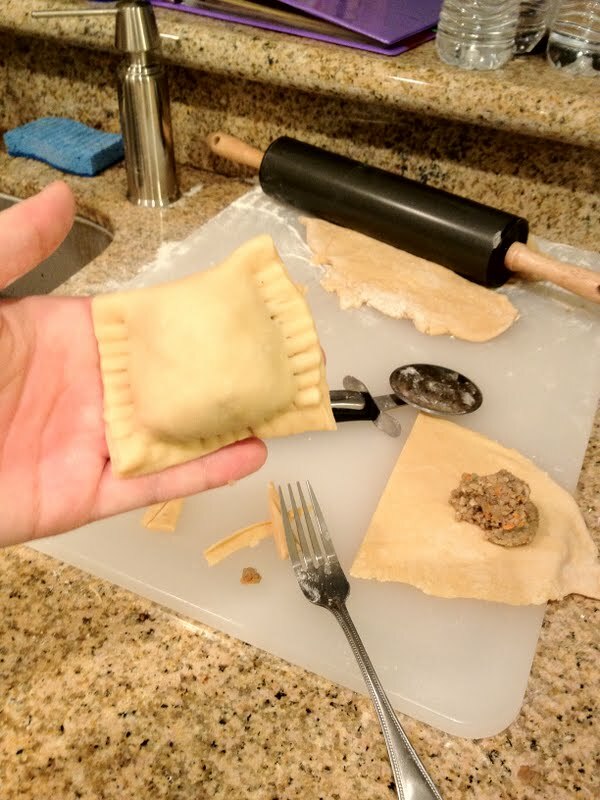 Press around the meat filling to squeeze out any air, and smooth edges flat. Use fork to press down the sides so that they are sealed together. 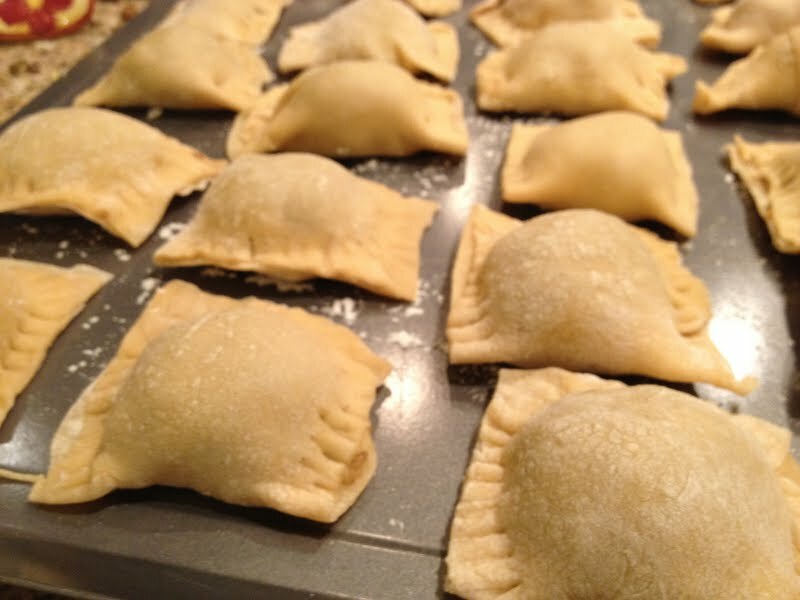 As you are making your raviolis, line them up on a lightly floured cookie sheet or a parchment lined cookie sheet. Once you fill up a sheet, stick them in the freezer. Once completely frozen you can move them to zipcock bags and store them in your freezer until you want to use them. Otherwise, you can just start cooking them! Drop Ravioli in boiling water, carefully. Cook until they float to the top. When they float, they're done! Serve with marinara sauce, parmesan cheese, and with homemade garlic bread.